The day after the NFL season ended, not a week or a month, but the next day, three teams filed an application with the league office to relocate and build new stadiums. That means three teams with hundreds of thousands of loyal fans, massive facilities with a huge infrastructure of employees and offices all want to pack up their bags and move to another town. They all want ginormous stadiums. The three teams are the Oakland Raiders, Los Angeles Rams and the San Diego Chargers. Not just one team, mind you, but three. And they all want to relocate and build new mega-stadiums in just one city, Los Angeles. Understandly, LA is the second largest media market in the US. What’s not so easy to understand is why did two of those teams, the Oakland Raiders and the St. Louis Rams, leave that city years ago when they were there? Again, the main reason is a mega-stadium. These teams want bigger facilities. More modern facilities. With those fancy, luxury skyboxes that corporations are willing to spend millions on. They want to add more club level seats. More clubs. More room for gigantic concessions stands. And more seats. Better seats fans are willing to drop more dollars on. Heck, the Chargers-Raiders want to add a giant outdoor farmers market as well. A new, mega-stadium is a big deal. These humongous structures attract a lot of attention. They are like modern-day pyramids. Look at all the buzz generated by the billion-dollar AT&T Stadium that is the home to The Dallas Cowboys. It’s the world’s largest domed structure. That facility has been featured more times in the media than the pyramids. Here’s what’s going on with each team. The St. Louis Rams are frustrated with their stadium. So they want out. Right after the team announced they were leaving, the city of St. Louis, which has been grappling with how to keep them there, came up with a $1 billion proposal. Of that, $460 million would be in public funding, a very risky political move. Not many voters are in favor of paying for a stadium for these super-wealthy team owners. Speaking of which, the super-wealthy owner of the Rams announced he has already developed plans for a $1.86 billion stadium project in Inglewood, near the LA International Airport. Then you have the Chargers. That team has played in San Diego since 1961 and their stadium is falling apart. They can’t get a new stadium there. So they want to move to L.A. This is a defensive move as well because about 25% of their fans come from LA. So if a new team moves to LA, they could lose those fans. Then there’s the Oakland Raiders – well, if anybody knows the Oakland Raiders, they are just weird. They once moved to LA – and then moved back in 1995. Now they want to move back to LA. Whatever. What’s even stranger is that they are teaming up with the Chargers to build a mega-stadium, at a cost of $1.75 billion, in Carson, CA. They will share that mammoth facility – like the Giants and Jets share The Meadowlands. That stadium is pure Hollywood – a proposed 56,000 sq. foot bar, premium seatings like a Directors Club with a club within a club or seating called the “Academy Suites.” The original proposal called for Charger lightning bolts to be shot into the sky. The 32 NFL team owners make the final decision. Ayes are needed from 24. It would only take nine to block any move. The league has a team of researchers reviewing the applications and figuring out the implications. Any move could have a monumental effect on revenues for a league that already has monumental profits. The owners will be presented with the facts and applications at Jan. 12-13 annual meeting. Just like a hit from a blitzing linebacker, a city could find itself knocked out the league and without an NFL team in no time. But don’t think those officials in those current NFL cities are taking this lightly. Losing an NFL team and all that revenue and national publicity that goes with it would be a major downer for any town. San Diego officials wanted to put a $1.1 billion proposal before voters. St. Louis is scrambling to raise the money and put together a $1 billion package as well, even though the Rams still decided to announce they were leaving (a little bit of gamesmanship perhaps). The big question is, how much will cities pay to keep a team in place. Here’s the mayor of St. Louis endorsing a proposal to help fund a new stadium. Here’s the state legislature in Missouri opposing the spending of any funds for a new stadium. See how tough this is? Why all the fuss? What is the value of a new stadium? If anything, this century will be known as the era of the super-stadium. You have the massive AT&T stadium in Dallas. Another is going up in Minnesota for the Vikings. Then there’s a new one under construction in Atlanta for the Falcons. Between 2000 and 2009, there were 31 new major league stadiums and arenas built. Many existing facilities also experienced huge upgrades. Don’t forget baseball teams, where their stadiums easily cost more than $500 million. Basketball and hockey arenas, while smaller, can still cost nearly $300 million to build. Most of these facilities are built with some public funds. And San Diego, Oakland and St. Louis are all wondering how are they going to keep their local teams and how much public money will it take to keep them. Sure, every city would love to have an NFL team. But the actual value of having an NFL team in a city is widely disputed. In a study commissioned by the Raiders and Chargers, they contend their new stadium proposal for Carson would generate $531 million in local revenue and create 13,380 full-time or part-time jobs. Some economists will say that seems a little pie in the sky considering that teams generally only play eight regular season games at home. Aren’t those more part-time than full-time jobs? There’s also the estimated $118 million in state and local taxes, hence a nice return on investment for cities. But then again, consider the other uses for a stadium. Concerts for one. Just one concert by a nationally-known star can dump a ton of money into a town overnight. Then you have other events from monster truck rallies to evangelical gatherings. Heck, they now play hockey games in giant stadiums. Build it, and people will show up. 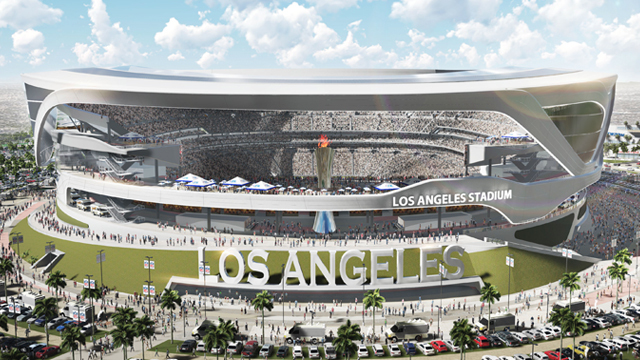 Plus, if LA ever lands the bid for The Super Bowl, which is very likely with this stadium proposals. Watch out. That impact would be humongous. Building these colossal stadiums alone has tremendous impact. Again, in the Carson, CA, study, it is estimated the construction alone will create $1.1 billion in local labor income and $2.6 billion in total output. Some economists say the numbers used by advocates of stadiums are greatly exaggerated. Even if exaggerated, if you take them over say, a 20-year period, they still add up to significant revenue. Our prediction? The NFL owners will approve the Charger-Raiders move and their proposal for a new stadium. Why? For one, these two teams would create a huge fan base for all of Southern California and possibly the entire state. Two, the Raiders are in too small of a market for an NFL team. Three, the Chargers desperately need a new stadium. Fourth, I bet the city of St. Louis coughs up the bucks for the St. Louis Rams to stay. Plus, the NFL would lose the St. Louis market and the huge fan base surrounding this Midwestern city. What does any of this have to do with local high schools or middle schools? There is a correlation. That common theme is that a modern, well-maintained stadium has several positive implications for a town, no matter what size. For schools – no fan wants to sit on crummy, splintered, broken down wooden bleachers. If you want fans to show up, create an atmosphere that is attractive. Add newer aluminum bleachers, for example, that require little maintenance but will immediately provide a sparkle to any location. That makes a venue appealing for parents, relatives, friends and students. Secondly, even on a local level, a shiny bright stadium or set of bleachers has an economic impact. When the venue attracts spectators, those spectators will spend money at local restaurants and stores. They will buy gas. If the venue is really attractive, then it will attract regional tournaments. In that case, now you have bunches of students, family and fans spending money in local restaurants and gas stations. Some will even stay in area hotels overnight. All those dollars circulate around a town several times. The restaurant owner and employees buy local goods from other local merchants, etc., etc., etc. The other factor that is hard to measure but is real, is the psychological impact of having an attractive venue with clean, new, shiny aluminum bleachers. For one, a first-class venue instills pride in the students, the players, their families and fans. Secondly, a first-class athletic facility impresses visitors, many who might end up moving there and becoming residents. Economic development experts will tell you that having a NFL stadium in your city elevates your town to another level. It’s attractive to corporations. For one, those corporations now have a place to entertain clients. Secondly, having an NFL team in your city is just one more factor that makes it a desirable place to live for employees. (Remember, we are talking about the most popular sport in America. As they say in the movie, this organization “owns a day of the week.”). Any athletic director, business development director, or even school principal might want to pay attention to what is playing out on the bigger stage in Los Angeles with those three NFL teams. There is a reason for all this brouhaha over stadiums. Nice, big, clean stadiums, whether they are made with concrete and cost a billion dollars or are filled with aluminum bleachers in a field, are a big deal in the public’s mind. That’s the value of a stadium. 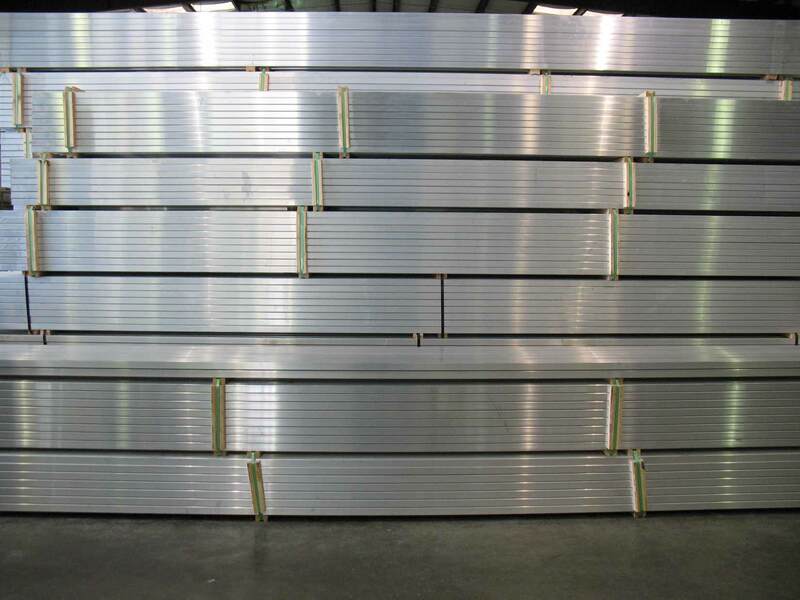 Aluminumbleachers.com can spruce up any facility with our variety of bleachers for sale – from 15-row aluminum bleachers to 3-row bleachers. We also offer portable bleachers and tip and roll aluminum bleachers. Update: Well, we were close in our prediction. The NFL has approved the proposal for the St. Louis Rams to become the Los Angeles Rams once again. (We missed that.). But they also approved an option for the San Diego Charges to join them. Probably a good idea, the cost of the proposed stadium in Inglewood is now $3 billion with a giant “B.” That’s a lot of aluminum bleachers.